Our Sales & Parts Division (Twin Aviation), which is led by Sergio Gonzalez, Vice President, is an ASA-100 Accredited, independent, worldwide distributor of aircraft spare parts and supplies. Conveniently located near international airports and major U.S. interstates, our South Texas location gives us easy access to anywhere in the world. We stock several thousand line item parts in our comprehensive inventory to supply a wide variety to support our customer's needs. Our commitment to customer satisfaction is evident in our intense focus by our knowledgeable team of parts analysts, quality assurance professionals, and export compliance specialists. By hiring industry leaders and providing continuing training, we maintain an incomparable level of product knowledge. Backed by the latest in management information systems, we have the tools we need to get you the aviation parts and supplies you require. Years of experience have allowed us to develop and maintain access to an extensive inventory of aircraft parts for our customers worldwide. Unlike most aircraft parts specialists, our commitment to our customers doesn't stop at the end of our inventory. Our customers keep coming back because they know that if we don't have it, we will find it. Our strong network and close working relationships with certified manufacturers provide us with options. From one part to large quantities, we are ready to assist you in any way we can. All parts are made exactly to print. No deviations are allowed. If you need a part reverse-engineered, we have the DER's that can assist in the process. Our years of tooling, design and machining experience will allow our customers the peace of mind that your requirements will be fulfilled on time. Our comprehensive industry knowledge is backed by an extensive technical library to ensure perfection every time. This resource is the backbone of our industry expertise and is regularly being updated and supplemented, giving us an edge in aviation technical expertise. Knowing exactly what you need is the first and most important step in getting you what you require. Our Sales & Parts Division is committed to consistently meeting and exceeding our customers’ expectations by providing service, quality, and reliability. We have set the standard by investing extensively in our people, our systems and our inventory. 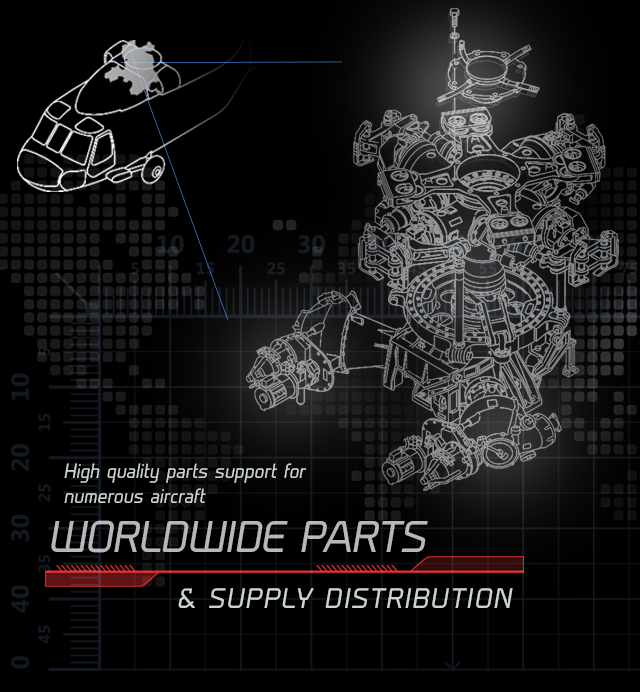 By focusing on an end-user driven system, we deliver quality spare parts to our worldwide customer base. Our specialty is stocking and sourcing major components for the UH-60/S-70 Black Hawk helicopters and other aircraft. Several major repair companies, fleet management services, and various federal, state and local government agencies regularly rely on our Sales & Parts Division. Our in-house parts analysts pride themselves on their ability to locate parts to ensure you have what you need. We believe you should never have to settle for what happens to be available. You deserve the security of a team of experts that locate the parts you need and gets them to you in a timely manner. Our extensive inventory and network of manufacturers, combined with a company philosophy of never stopping until our customers are back in the air, has made us a leader in aircraft component sourcing. Aircraft on Ground (AOG) services are available 24 hours a day by calling 1-830-570-5924. In our Sales & Parts Division, Quality Assurance (QA) is the cornerstone of our culture. Our QA department is active in every aspect of what we do, and it is always evident when the part reaches you, correct and on-time. We are fully ASA-100/FAA AC 00-56 B Accredited to ensure a high standard of perfection. With parts inspected, documents filed, vendors audited, equipment calibrated, and technical publication cataloged, you can rest easy in knowing that you have the highest level of support. First-rate Quality Assurance is the number one reason our customers keep coming back to us. When you know that you will always get the right component, on time, you will never need another parts supply company again. Gone are the days of calling several locations to find what you need, let us do it for you and save you time and money. Export Compliance laws are ever-changing and require full compliance with several government entities. When selecting a parts supplier and distributor, you need the experienced team we provide to ensure compliance. In the aviation industry, even the smallest fault can result in extensive delays that you cannot afford. That’s why we invest a tremendous amount of time and resources to make certain we are following all regulations demanded by every controlling federal agency. Our policy and manual for our Export Management System includes decision trees that aid our personnel in this area. Our Sales & Parts Division is a Registered Exporter with the U.S. Department of State and the U.S. Department of Commerce. We hold several Blanket Export Licenses and can apply for additional export licenses for our international customers to facilitate timely delivery with full compliance. Our Sales & Parts Division is an ASA-100/FAA AC 00-56 B Accredited, independent, global distributor of aircraft spare parts and supplies. Conveniently located near international airports and major U.S. interstates, our South Texas location gives us easy access to anywhere in the world. We stock several thousand line items in our comprehensive inventory to supply a wide variety of solutions in support of our customer’s needs. We are equipped with a state-of-the-art inventory control system. This provides modern high-efficiency controls, enabling us to satisfy the aviation industries’ demands. We also acquire and stock several thousand other line items from the OEMs, commercial airlines, FAA repair stations and Part 133/135 Helicopter Operators. Our extensive inventory consists of a wide variety of parts, components and supplies specifically targeted to our customers requirements. Our success is due to two things: the incredible people on our team and our company philosophy. We do whatever it takes to ensure the success of our customers, to get their aircraft in the air, keep them safe, and keep their fleet efficient. It doesn’t matter if you have one helicopter or a squadron, if you need one easy to find part or several elusive parts, we do not stop until the mission is accomplished. Whatever your requirements, contact us and we will make it happen. Our ability to say “yes” when others often say “no” is what sets us apart from our competition and what keeps our customers coming back for all of their needs.